A line of bass sequences weaves a sneaky approach which gets loose as a movement of escalation playing in loops. This structure of quiet rhythm is of use as bed to arpeggios which float gently and which complete the melody with silky arrangements where the synth harmonizes its airs with some fanciful violins. No matter the genres, Ronald Schmidt does not lose his harmonious touch as shown by this "Corsica", a quiet title which makes us derive to the door of "Dreamtime" and of its vaporous intro. Pulsations activate the rhythm a little after the point of sixty seconds. These pulsations turn into knockings and raise rumblings of percussions which structure an always quiet rhythm but which is similar to a slow ride. The synth raises some very beautiful solos which sing over a fauna of sequences a bit organic and which melt their charms in these arrangements that Faber hides in his vault of melody for melodramatic movies. We have no choice but to like this track which flirts slightly with the music of Tangerine Dream of the TDI years, but with more emotionalism. "Americans" is the first track which really gave me the taste to pursue and to discover a little more the universe of “Earthbeats”. And it's there that I seized the concept of this last Faber opus which is an impressive mosaic of rhythms of the world where Ronald Schmidt makes us travel through 5 continents with 12 music pieces which reflect well enough the various cultures which compose them. "Americans" is a delicious tribal music title of the first native nations. The lascivious rhythm, like a kind of spiritual trance, and the sound effects which depict the native character are coated of superb orchestrations which divide the rhythm of the lento momentums. A splendid guitar traces a very beautiful melodious approach which still haunts my ears. But not as much as these shamanic chants and those tribal songs which dig a little into Mike Oldfield's universe of The Song of a Distant Earth. We have the fever for it at once... Here and on the very lively "Surat" which is a great Arabian techno loaded with the fragrances of the Middle-East, a little in the spirit of Muslimgauze, where some sitar notes, finely pinched, decorate a very danceable soundscape. One likes sitar? "Indian Flavour" should then seduce you with a suave ballad which tucks a soft spiritual trance and which is fed by Hindus chants besides being harmonized with delicate manual percussions. Here, as everywhere in “Earthbeats”, the caresses of the synth violins tickle the threads of our emotions. "Beijing Park" is designed on the same bases as "Surat", except that the rhythm is slower here and the sitar gives way to nice arpeggios filled of Asian essences. More orchestral, with synth layers scented with the fragrances of Le Parc, "Sheeba" is a short track which allies the silky orchestrations of "Surat" on a "Dreamtime" rhythmic pattern. "Boi de Boulogne" does very France with an interesting duel between a keyboard and a very well constituted acoustic guitar. The rhythm is lively, cheerful and light like a ballad in automobile in Provinces. The percussions are simply bewitching here with a very retro rhythmic charm. 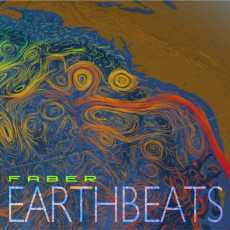 Arched on two exchangeable phases, "Tangerine Moon" is the most electronic title of “Earthbeats”. The sequences trace some wide stroboscopic zigzags and their crossed movements weed a huge bank of mist. The synth lies harmonies under the forms of very stylized solos, which sound like Tangerine Dream, while the keyboards chords resound like Rick Wright's memories. If another line of sequences makes diversion to the rhythm, the duel synth and guitar, very rock electronic by the way, gives a very interesting second part. It' a solid track which sounds out of tune in the landscape of “Earthbeats” because of its very electronic approach. "Sahara Queen" offers a good slow tempo to the delicate mystical Arabian essences with breaths of voice which bewitch the organic tones of the chirpings of sequences and which compete with the ethereal layers of a synth loaded of nice electronic harmonies. The contrast is striking, but not as much as these tribal percussions which bring "Sahara Queen" towards a good mid-tempo and its airs of a sweet morphic trance. This is another catcher. "Footprints in the Snow" and "High Mountains" close this last Faber opus in a soft mode. The first track unveils a veil of contemplativity with arpeggios of ice which resound on an immense carpet of snow while that "High Mountains" leads us in the heights of the world with a strong dramatic presence of the winds and strings instruments. Majestic, we hear chirpings of birds in this ode in the serenity singing with the sun and the blue of the sky, showing without any doubts that Ronald Schmidt feels at ease on all fronts and that he has an undeniable talent for these harmonies and these arrangements which transcend the universe of EM and give us shivers to the soul.